Cornelia Fort was an unlikely candidate to be the first American woman to die on active military duty. The oldest of five children born into a wealthy family in Nashville, she was a debutante who graduated from Sarah Lawrence and seemed destined for a quiet life. But Cornelia wanted to fly, and fly she did. She took her first lesson in 1940, shortly after her father died. She soon became first female flight instructor in Nashville. In 1941, she took a job in Fort Collins, Colorado as a flight instructor with the Civilian Pilots Training Program, established under President Franklin Roosevelt. Later that year, she was hired to teach defense workers, soldiers, and sailors to fly on a U.S. military base in Honolulu. There, flying on the morning of December 7, 1941, she was a witness to the Japanese attack on Pearl Harbor. In 1942, she joined a select group of women aviators in what would become known as the Women’s Auxiliary Ferrying Squadron (WAFS), charged with delivering planes newly off the assembly line to military bases across the U.S., freeing up male servicemen to engage in active combat. 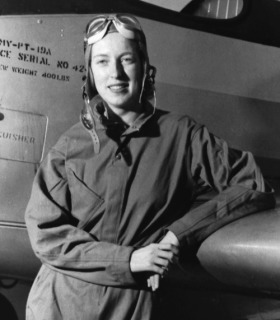 On a delivery mission to Love Field in Dallas from her base in Long Beach, California, she was killed in a mid-air collision. Cornelia Fort was 24 when she fell to her death from the skies above Mulberry Canyon, Texas, ending her short but adventurous life. Even now, 70 years later, her legacy stands out for its example of one woman’s commitment to a larger purpose. Like many other members of The Junior League, past and present, she consciously broke down barriers and, in doing so, made a lasting impact.